A Soyuz spacecraft carrying a Russian commander, a NASA flight engineer and a Japanese astronaut -- all veteran space travelers -- blasted off and streaked into orbit late Saturday (U.S. time), the first leg of a two-day flight to the International Space Station. Under a partly cloudy sky, the Soyuz TMA-05M spacecraft blasted off from the Baikonur Cosmodrome in Kazakhstan at 10:40:03 p.m. EDT Saturday (GMT-4; 8:40 a.m. Sunday local time) and quickly climbed away atop a rush of fiery exhaust. The launching came on the 37th anniversary of the 1975 Apollo-Soyuz Test Project that opened the door to U.S.-Russian space cooperation. "So how are you guys doing?" 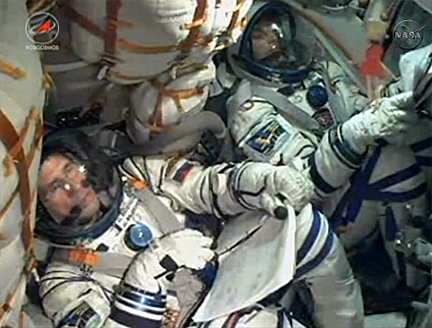 Vladimir Popovkin, director of the Russian federal space agency, asked the crew a few minutes before liftoff. "All comfy?" 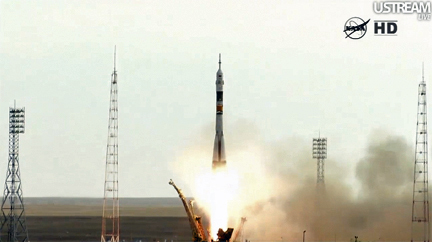 "Yes sir, we're all situated and getting ready," Yuri Malenchenko, the Soyuz commander, replied. "Excellent. I don't want to take up any more of you time. I wish you all the best, best of luck during the ascent and free flight operations. And hopefully, everything that you wish for will come true. All the best to you." Live television from inside the central command module showed Malenchenko, strapped into the center seat, monitoring the automated ascent, flanked on the left by board engineer Sunita Williams and on the right by Japanese astronaut Akihiko Hoshide. All three appeared relaxed as they monitored cockpit displays, tightly strapped into their custom-fitted couches. The Soyuz rocket appeared to perform flawlessly and eight minutes and 45 seconds after launch, now moving at more than 5 miles per second, the TMA-05M spacecraft slipped into its planned preliminary orbit. A few moments later, the ship's two solar panels unfolded and antennas deployed as programmed. "Congratulations on your orbital insertion," Popovkin radioed. "Everything was successful. I hope everything goes just as well from here on." "Thank you so much," Malenchenko, presumably, replied. A few moments later, after reviewing telemetry and tracking data, a flight controller added: "On behalf of myself personally and everybody else at the mission control center I'd like to congratulate you with a successful ascent (to) orbit. We wish you all the best. Have a very good flight." If all goes well, Malenchenko will oversee an automated approach to the International Space Station, docking at the Earth-facing Rassvet module around 12:52 a.m. EDT Tuesday. Standing by to welcome them aboard will be Expedition 32 commander Gennady Padalka, cosmonaut Sergei Revin and NASA astronaut Joseph Acaba, who were launched to the lab on May 15. They've had the station to themselves since July 1 when Expedition 31 commander Oleg Kononenko, European Space Agency astronaut Andre Kuipers and NASA astronaut Donald Pettit returned to Earth. 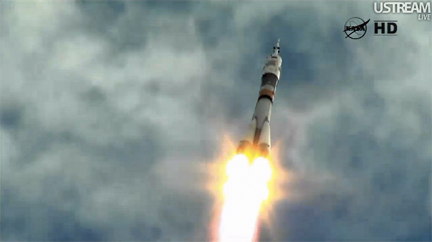 The Soyuz TMA-05M launch kicks off a busy six weeks of work aboard the space station and at ground control centers in Japan, the United States and Russia. On July 21, the Japanese space agency plans to launch an unmanned HTV cargo ship to the station. The next day, the Russian Progress M-15M supply craft docked to the station's Pirs module will undock, fly to a point about 250 miles away and then fly back to the station in an automated approach intended to test a new rendezvous antenna. Docking is expected around 1:24 a.m. EDT on July 24. Three days after that, the astronauts will use the station's robot arm to capture the Japanese HTV so it can be berthed at the forward Harmony module. Hatches will be opened the next day. On July 30, the Progress M-15M will be undocked for the final time, clearing the way for launch of the Progress M-16M cargo craft on Aug. 1. Two days later, the M-16M spacecraft, carrying a fresh load of supplies, is expected to dock at the Pirs module. Along with the supply ship activity, four crew members will be gearing up for two spacewalks. Malenchenko and Padalka will venture outside on Aug. 16 to relocate a Russian cargo crane and to install micrometeoroid debris shields. Williams and Hoshide will carry out a U.S. spacewalk Aug. 30 to replace a balky solar array power distribution box, called a main bus switching unit, and to install cables that will be needed after a new Russian lab module is delivered in a year or so. "They've got a fantastically busy mission ahead of them, they are looking toward nine visiting vehicles during the time they're up on board the space station, which is really a lot of coming and going," said NASA chief astronaut Peggy Whitson, a veteran space station commander. "It's going to take a lot of choreography by the ground teams and the crews on orbit to make this all happen. It'll be a very challenging and exciting time for them." Here is an updated launch-to-docking timeline for the Soyuz TMA-05M mission (in EDT and mission elapsed time). This timeline is provided for general guidance only. The docking time has been updated, but other rendezvous events may be off by a few minutes.